Home > Envelopes > A2 Envelopes - 4 3/8" x 5 3/4"
Measurements - 4 3/8" x 5 3/4"
Envelope, Cream Square Flap A2 4 3/8" x 5 3/4"
Envelope, White A2, 28lb Bond 4 3/8" x 5 3/4"
Envelope, Cream A2 28lb Bond 4 3/8" x 5 3/4"
Help our environment with our 100% Recycled Cream A2 Envelopes! 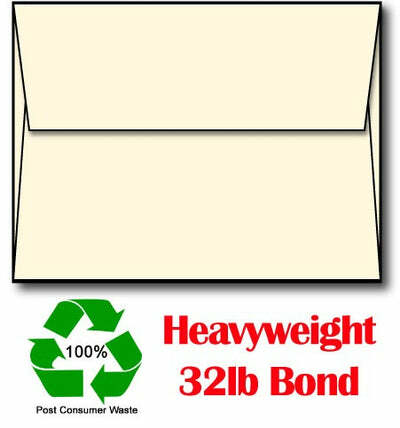 These heavyweight A2 Cream envelopes are made from a 100% Recycled Cream 32lb bond / 80lb Text paper stock, which is thicker than your average envelope. These heavy A2 Envelopes are great for carrying greeting cards & invitations for formal events, important messages, and much more. These Cream A2 envelopes measure 4 3/8" x 5 3/4" and perfectly fit our 4up postcards, 2up greeting cards and cards around the 4 1/4" x 5 1/2" size. Inkjet and laser printer compatible. Envelopes feature a gummed square flap.